At North Jersey Laser Associates our clients’ safety and satisfaction come first. We provide effective and affordable treatments to remove unwanted hair. At North Jersey Laser you will be cared for by professional medical staff, using the latest FDA approved laser hair removal technology. 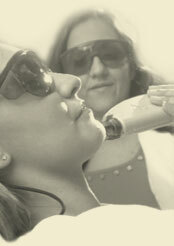 Using the GentleLase from Candela Corporation, we are able to offer fast results with the least amount of discomfort. Treatments are available for both men and women with remarkable results! We offer convenient weekend and evening hours. Dr. Alessio will educate you on the process of laser hair removal and how this will transform your life. Dr. Maryann Alessio has been in private practice since 2001, offering comprehensive and preventative health care to all ages from newborns to elderly. She is also the owner of North Jersey Laser Associates since 2006, specializing in laser hair removal for both men and women. Dr. Alessio grew up in Nutley and is of Italian descent. With her Italian heritage she personally knows the inconvenience, the stress and the strain, of excessive hair growth and wanted to offer it to her patients. It is gratifying for her to see the freedom and the self confidence that emanates from her clients as a result of laser hair removal. Are you interested in receiving hair removal treatment? Please feel free to call us today with any questions or concerns. We are here to answer all questions.